I haven’t reviewed a book in a while, so let’s do it! It is near impossible to answer this question. It is mostly an allegory on the Reformation and an implied defense of the Church of England. However, every other chapter is a digression (A Digression Concerning Critics, A Digression in the Modern Kind, A Digression in Praise of Digressions, and A Digression Concerning Madness). The digression chapters are supposed to infuriate the reader because they have nothing to do with the story and often aren’t about anything at all. There are also a couple of prefaces at the start of the work. Finally, Swift loves insert random Latin quotes into his works. I believe that some of the quotes in this satire were in fake Latin. Jonathan Swift’s A Tale of a Tub is both a satire on religion and on the literary and political movements of seventeenth-century England. I have taken two graduate courses on seventeenth-century French literature, so I have a basic understanding of the literary movements of the period. I also have more than a little obsession with Christian history. But even with that background I had difficulty following A Tale of a Tub. The religious satire was clearly a defense of the the Church of England. A coat given by a father to three of his sons represents the Apostolic faith. The three sons are named Peter, Martin, and Jack. I’ll let you guess who the three sons represent. The religious satire was OK. It was a bit too obvious for my liking. Oddly enough, I preferred the digression chapters even though they infuriated me. While I had difficulty understanding them (which I believe is the point) I noticed that Swift was ridiculing contemporary publishing and the Battle of the Ancients and the Moderns. In fact, the companion work (which I reviewed in 2015) is called The Battle of the Books. He also made a reference to Erasmus’ Praise of Folly. I love it when I am able to recognize intertextuality. I would like to revisit the digressions at some point because I’m sure I missed a lot the first time around. But again, I’m not sure if I was supposed to read them carefully. A Tale of a Tub was brilliant in its construction even if the religious satire fell a bit flat. It reminded me of Diderot’s Jacques the Fatalist, which I definitely will be reviewing soon. 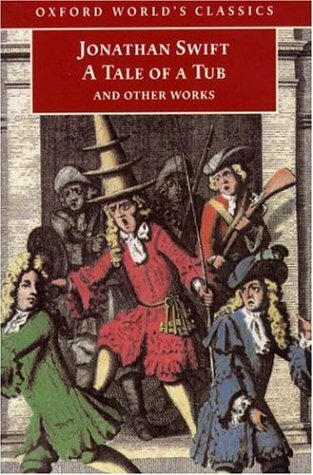 Swift is a difficult satirist to read because he addresses seventeenth-century English society. But that is also why I enjoy reading Swift. He encourages me to work for my humor. I hope than in a few years I will be able to appreciate A Tale of a Tub more. Parnassus has two hills. The tallest is occupied by the Ancients and the shortest is occupied by the Moderns. The latter constantly feel threatened and offended by the height of the Ancients’ hill with respect to their own. The Moderns therefore propose a solution; they offer to use their own shovels and lower the hill of the Ancients so that the two hills can be of equal size. The Ancients do not accept the offer, responding instead that the Moderns should be grateful that the Ancients have allowed them to exist peacefully as a colony. The bickering between the two hills eventually grows into a full-fledged battle. But the battle of the Ancients and the Moderns is not a battle between individuals but between books housed in King’s Library. The Battle of the Books by Jonathan Swift is a satirical look at the tension between ancient and 17th century ideologies. Do the moderns stand on the shoulders of giants or are the ancients irrelevant for the enlightened world? Jonathan Swift is a brilliant satirist. Whereas most satire today is straightforward and obvious, Swift’s satirical works contain layers of meaning. The reader is also expected to have a fair bit of knowledge about philosophy, history, politics, and religion. The Battle of the Books was harder for me to understand than Gulliver’s Travels because I am not well-versed in ancient or 17th century philosophy. As a result, there were many parts that I did not understand. What I did take from the book, though, is Swift’s insight that the Moderns are dreamers and think that they are self-creating but they are, in truth, constantly indebted to the philosophers who preceded them. Still, Swift doesn’t let the Ancients off the hook either. The allegory of the bee and the spider was my favorite part of the tale because it outlined the different ways in which the ancient and 17th century philosophers approached the acquisition of knowledge. I was a bit disappointed that the story ended so abruptly, but there were many parts that gave me food for thought. 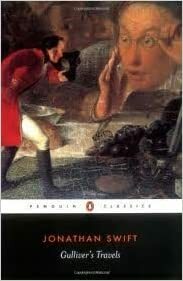 Overall, I enjoyed the short tale and hope to read more of Swift’s works in the near future. Jonathan Swift is often accused of being a misanthrope because of the way human nature is portrayed in Gulliver’s Travels. Lemuel Gulliver leaves the country of the Houyhnhnms with a deep dislike for mankind. He treats his wife and daughter infernally and considers it a great privilege to have met the Houhnhnms – that superior race of horses. Throughout the whole book, in fact, the weaknesses of society and human nature are described in great detail giving the impression that Swift thinks he is superior to others. But is Lemuel Gulliver the same as Jonathan Swift, and are the Houyhnhnms as excellent as Gulliver thinks they are? I purport that a closer look at Part IV reveals a message that is a lot less misanthropic than at first glance. But let’s first take a look at Gulliver’s previous voyages. The first land that Gulliver visits is Lilliput, a land inhabited by doll house-sized people. From their perspective, Gulliver is a giant and a freak. He eats hundreds of times more food than the Lilliputians and can deter invaders with his bare hands. In Brobdingnag, everything is reversed. Gulliver is tiny while the inhabitants are giants. It is safe to say that his adventures in both lands cause Gulliver to lose a sense of proportion. He is either the most conspicuous figure or the least noticed. In both cases, he is a freak whom people pay to see. The presence of the other shapes Gulliver’s identity. When Gulliver returns from Brobdingnag, he stoops down to kiss his wife because he is so used to being surrounded by giants. In comparison to the Brobdingnagians, his wife is tiny. But notice that Gulliver still thinks he is larger than his wife otherwise he would not have stooped down to kiss her. Gulliver wants to be normal. He doesn’t want to be a freak. No one does. To avoid feeling like a freak, Gulliver adjusts his worldview to match that of the Brobdingnagians. Now, let us turn to Part IV of the book in which Lemuel Gulliver encounters intelligent horses and degenerate humanoids. The Houyhnhnms claim that they are an intelligent race – a race that lives by reason alone. In Houyhnhnm Land, the greatest and the least are side by side. Gulliver is at first horrified by the Yahoos, but the Houyhnhnms convince him that humans are even worse than these beasts. The Houyhnhnms introduce us to their society, which at first glance seems perfect. 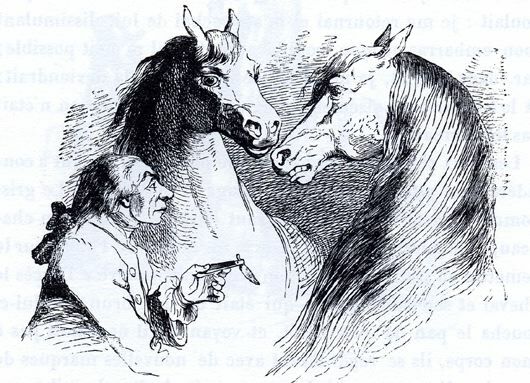 The first four times I read Gulliver’s Travels I too envied the horses. Even though certain aspects of their society made me feel uncomfortable, I didn’t bat an eye. Why should I? They are the superior race. They say so themselves. Like Gulliver, I took their word for it. The Yahoos, in comparison, disgusted me. I don’t know which is worse: the Houyhnhnms’ belief that they are superior to others and therefore have the right to determine who should live or die, or Gulliver’s agreement with the Houyhnhnms that humans are worse than Yahoos and therefore, by analogy, even less worthy of life and love. Lemuel Gulliver used to be a surgeon but took up sailing late in life. He became the captain of several ships. On the last voyages of his career, Gulliver found himself in hitherto unknown lands occupied by creatures so unlike himself. His personal journals were later given to Gulliver’s cousin Richard Sympson for publication. Unfortunately, an unabridged account of Gulliver’s Travels was not published; instead, Sympson edited down the book to eliminate what he felt were unnecessary details. At the start of the book, Lemuel Gulliver expresses his displeasure toward the alterations; yet, it seems that all major events in Gulliver’s travels were still retained. On his voyages, Gulliver encounters doll house-sized people , 70 ft tall giants, philosophers living on a floating island, eccentric scholars, historical figures, and finally a race of intelligent horses. The dark side of human nature and English society is exposed in Jonathan Swift’s Gulliver’s Travels, one of the most famous satirical works of all time. When I heard that Cleo @ Classical Carousel was going to read Gulliver’s Travels for the latest Classics Spin, I offered to do a buddy-read with her. Gulliver’s Travels is on the list of my top 5 favorite books of all time. The first time I read it was in 8th grade. The English teacher mentioned the work in passing, and I just had to get my hands on a copy. I remember devouring it in two sittings. Although I have read the book five times, it was only during my last re-read that I fully understood the underlying message of Gulliver’s Travels. The last land Gulliver visits is Houyhnhnm-land. The Houyhnhnms (evidently pronounced ‘winums’) are a race of horses who far surpass humans in reason. They live alongside human-like creatures of beastly proportions whom they call Yahoos. Since much of the book is about the dialogues held between Gulliver and the bizarre creatures he meets, I don’t want to go too much into the conversations in Houyhnhnm-land lest I spoil the book for you. I will only say that I fell for Swift’s trap. What makes Jonathan Swift such a brilliant satirist is that he hides what I feel is the ultimate message of the book behind a boatload of overt and scathing criticisms of human nature. Unlike the irony in Voltaire’s Candide which I felt was too simple and obvious, the irony in Gulliver’s Travels is a lot more subtle. Satire is not for everyone and Gulliver’s Travels is no exception. Offensive humor and exaggerated imagery abound. Because this is my kind of humor (I wonder what that says about me 😮 ) I loved it. As I wrote on Goodreads, Swift is often accused of being a misanthrope, but I beg to differ.